The Ion is a very small 2 stage flashlight using a single CR2 lithium battery and featuring a Cree XLamp led. The light is activated twisting the head, a slight twist will bring the "low" mode of the flashlight keep turning and you will get the "high mode", a simple and yet very attractive interface that I found superior to the twist on-off models. The Cree Led coupled with an aluminium reflector and the AR coated ultra clear lens produce a very smooth beam that is almost 100% flood. This means the light illuminates a wide area without reaching far for illumination. This makes the Ion an excellent light for indoors use and as a task light, reading, repairs, inspection and other tasks are ideal with this little flashlight. The light can run for about 1 hour and a half on "high" mode reaching an amazing 140 hours on low mode. The body is constructed of HA-III aluminium knurled for a good grip and operation of the twist head. It will resist all sorts of impacts and scratches without damage. The interior of the light is coated in chemkote for better contact and resistance to corrosion, orings make the light waterproof and dunkable. The tail features a small hole for a splitring and a stowaway splitring for keychain or neck carry. Even with the splitring installed the light can stand on its tail and be used in candle mode. The Ion is a extremely small task light using top quality materials and design, it won't be the brightest light in the block but can certainly be the most useful one. You can get it in black, aluminium, gold, green, red,blue, natural or maroon at Fenix-Store for $150. 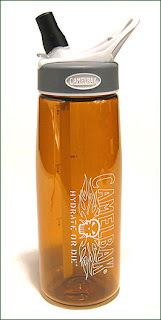 This is a 25fl.oz water bottle from CamelBack. It is constructed in Lexan polycarbonate a material that is bullet-proof so it will resist many hits, bumps and impacts without breaking. Lexan can also be heated without much damage so when camping and after removing the lid you might use this bottle to heat water but of course a metal utensil should be preferred. The cap features a no-drip bite valve, you flip up the valve and then bite to drink, flipping down the valve closes the valve making it quite safe against spills. With the valve up liquid should not spill unless you bite or press the valve but I wouldn't say this is a 100% spill safe as fliping down the valve. The cap is unscrewed to fill the bottle which is wide-mouthed for easy refilling. There is a small plastic handle in the valve that helps attaching the bottle to a backpack using a carabiner or something similar. On the side there is a scale listing the aproximate volume of liquid left in ounces and mililiters. The cap is standard sized so it will fit if you want other water bottles such as Nalgene and similar. We found the bite valve very easy to use and very practical for outdoor activities or urban hydratation, the bottle is practical and easy to carry and can be refilled with any normal water bottle or just from the tap if drinkable. You can order it from REI at $12.